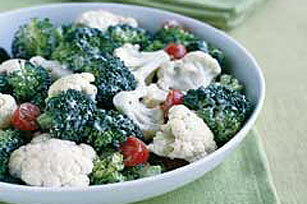 Celebrate a trip to the farmers' market with Creamy Broccoli and Cauliflower Salad. This broccoli and cauliflower Salad benefits from a bit of Parmesan. Mix dressing and cheese in large bowl. Store broccoli, tightly wrapped, in the refrigerator for up to 5 days.